Earlier this week we posted a rumor that the latest issue of Game Informer would reveal all the details of Dead Rising 2, and unveil the fact the game has a cooperative mode. Well, the latest issue has hit the Co-Optimus HQ and we've scoured the article for details. Co-Op Confirmed. 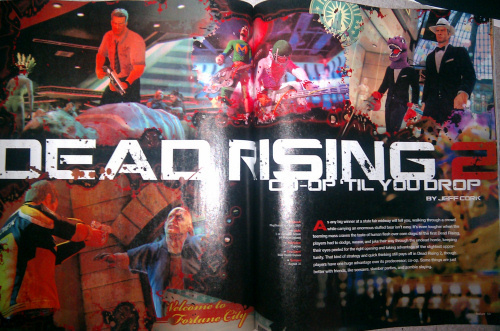 Dead Rising 2 will have each player controlling their own version of the lead protaganist, Chuck. Thankfully character customization is going to play a heavy role throughout the game, so it'll be easy to tell your Chuck from your friend's Chuck. Players can drop-in and drop-out at anytime online to help a friend out. Sadly there's no co-op specific moves, though cooperative tactics work quite well. The Game Informer preview talked about different ways to attract zombies - remote helicopters, noise makers, flashing lights. Players can work together to lure the hordes of zombies to specific areas and then clean up the mess. And by clean up the mess I mean make zombie meat soup out of them. The other big reveal in the article talks about how the customizable weapon system works. You'll be able to combine objects found in the game to create unique, and awesome, weapons. While obvious things like wine bottles and newspapers = molotov cocktails, there's other - more unique - options. There's several more like these as well in the article. To build them players can get inspiration from movie posters or cards found in the game's Casino and Mall - but it's not a requirement. Overall Dead Rising 2 sounds pretty good, and the final piece of the puzzle is the save system. Capcom assures us it's going to be revamped, but was coy on the details. When asked whether co-op progress would be carried from your zombie killing sessions with friends, they didn't have an answer. Lets hope they find a object combination for that to make it happen.